Marco Island is the largest barrier island of the picturesque Ten Thousand Island chain and just twenty miles south of Naples. Some of the words often used to describe it are "magical," "mystical," "alluring," and "a sun-drenched jewel." Marco Island is graced with miles of white sand beaches, luxurious real estate, beautiful year-round weather, sumptuous restaurants, fine shopping, dining, lively entertainment, attractions and plenty of recreational activities from swimming to sunning to sailing and shelling, from boating and fishing, to golf and tennis, and more! All set amid the stunning subtropical beauty that is unique to Southwest Florida's Gulf Coast. Four miles wide by six miles long, Marco Island is home to about 14,000 year-round residents. During the months of January through March however, the island population swells to well over 30,000 due to the annual influx of seasonal vacationers and winter residents, filling up the large inventory of resorts, hotel rooms, self-catering holiday homes, beach and golf course condos, private luxury villas, holiday lettings, family vacation properties, and apartment getaway packages. No wonder, with our dependable sunshine and winter afternoon temperatures usually in the 70's and 80's. 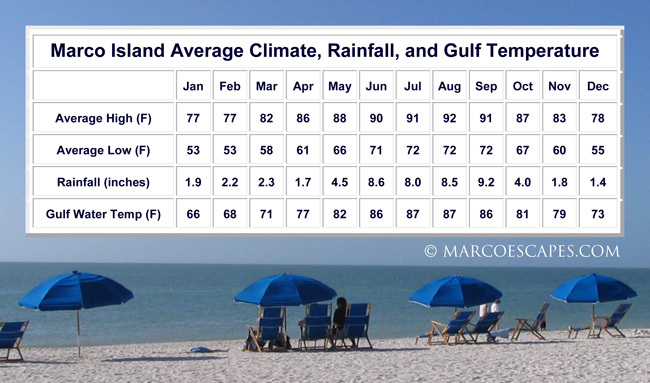 View Marco Island average climate, rainfall, and Gulf water temperature here. We at Marco Escapes bring a refreshing change to the vacation rental climate on Marco Island and the Naples area, and we are centered on delivering finer vacation rental properties, unparalleled professionalism, superior guest support, and performance for our property owners. From family vacations to a romantic rendezvous for two, Marco Island and Naples, Florida is an unforgettable paradise where memories are made. We invite you to explore our site to learn more about this unique community and our investments - no - our passion and commitments, to this beautiful piece of paradise under the sun.